Or get the deck or book individually. Measurements: 2.75 x 4.37 inches; or 70 x 110 millimeters. Back of card: Purple/blue with a dragon in each corner, though so fancy you may not recognize them. Book included: Yes, 178 pages, 4.55 x 7 inches; or 115 x 179 millimeters. Illustrated. Publisher: U.S. Games. Deck printed in Belgium, book printed in Canada. Comments: A delightfully wacky deck. Dragons in all kinds of poses, generally so convoluted you have a hard time making out what, if anything, they may be doing. Wands are shown as flaming chalices, none of the cups show water & none of the dragons in the deck spews forth fire. 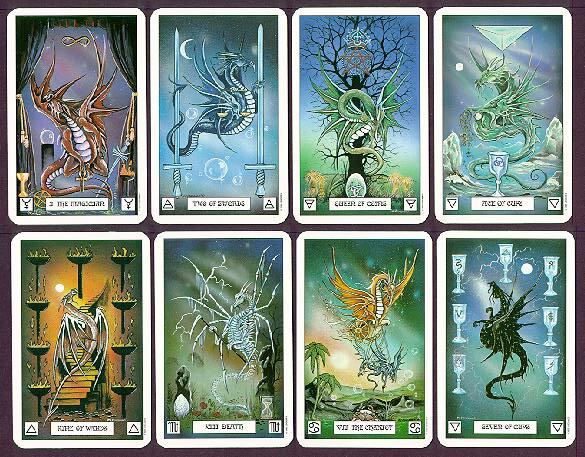 As a serious deck, most of the cards are weak on pictorial symbolism. This is really a fancy Marseilles-type deck in disguise, so if you want to use this deck for readings, you had best know your number-symbolism. According to the article, dragons were creatures with hugely overdeveloped stomachs. Since stomachs produce hydrochloric acid & this acid breaks down into hydrogen gas, this meant that dragons were essentially giant lighter-than-air gas bags. Well, dragons couldn't just go & burp out excess gas the way we do - if the hydrogen ignited, they'd go up like the Hindenburg. So dragons ignited & burnt the gas as they vented it, in a controlled fashion, which was seen by terrified townsfolk as fire breathing. From this also came the myth that swords plunged into a dragon melted. It's the natural reaction of metal to concentrated hydrochloric acid. It's also the reason there's so few dragon remains: The acid in the stomach at death ate the flesh up, or perhaps at death the remaining gas ignited & burned it up. In any case, dragons would have had very light, fragile bones, very light bodies, very weakly developed muscles, so, minus the gas, there just wasn't a lot to a dragon. There are very few old bird remains for the same reason, & dragons must have been even more fragile. For these reasons also, their liking for bare, craggy cliffs. If it wasn't bare before he got there, he'd burn up everything around it, just burping normally. And since, aside from their breath (the worst case of bad breath of all time), they had very few defenses, isolated places were important to them. Presumably a reptile, they would be sluggish in the morning & probably heavier than air as well, having lost some hydrogen overnight. So it's likely dragons would vent some of their remaining hydrogen to warm themselves the morning & get their systems going. This could also account for their prevalence in northern Europe, which is otherwise too cold for large reptiles. Wings would have helped circulate warmed air in those drafty caves, but otherwise would not have been large or powerful. They would not have been feathered. They would have been more like bat wings, even though bats are mammals. Dragon wings were used primarily for steering, not propulsion & were presumably adequate for a dragon's needs. As to a dragon's liking for young virgin females, I cannot say. Since so much of what dragons were reputed to be matches the giant stomach gas bag theory, it's hard to write off virgin feasts as just another myth. It might well be that young girls had some particular odor that interested dragons, or it might be that young boys put up more of a struggle. It could be that dragons needed a lot of meat protein to keep themselves afloat & that small furry mammals (dogs, cats, etc.) were too small or the fur got in the way of digestion, and it could be that full grown humans were just too heavy to carry off. Leaving undefended small girls as a dragon's first choice at mealtime. People who are clever with physics & math could answer this question: What volume of hydrogen gas is needed to carry away a kicking & screaming 40 pound person? If this is how dragons got fed, then we presume they could generate the necessary additional hydrogen within a very few seconds, so a dragon with prey would be a very bloated affair. Anyway, there are a lot of old accounts of dragons & some reputed dragon remains here & there. It's not entirely impossible that dragons once existed as real creatures. I'm indebted to the author of the Omni article for these insights & would appreciate if any browser happens to know who he/she is. Leave me e-mail.